Let's see--we have boating, fishing, canoeing, swimming, hiking--and what else? 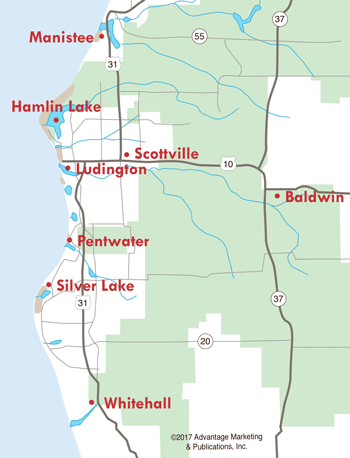 There's such a variety of things to keep you entertained while you're in the Hamlin Lake area, just four miles north of Ludington! Put your boat in the water at one of Hamlin Lake's launches, or rent a boat and motor from a local marina, then explore Hamlin Lake's beautiful shoreline from the water. Park your boat at the sand dunes for sunning and swimming on Hamlin's northern beach or pull in at shore at the Ludington State Park for a picnic lunch and a leisurely hike on one of the marked trails. Enjoy an evening of music at Shagway Arts Barn or catch a summer concert nearby. Boredom is never a problem around Hamlin Lake.